On 13 November 2017 between 14:07 and 14:11, the Atarib market and police station were targeted by three airstrikes resulting in the death of 69 civilians, significant damage to several buildings on the Atarib market street, and to the Free Syrian police building. Open source materials indicates this attack was conducted by either the Russian or Syrian airforce. Atarib city is included in the de-escalation zone memorandum signed by the sponsoring states of the Astana Talks (Russia, Turkey and Iran) and has no military headquarters for ISIS neither Jabhat AL Nusra. The Atarib market has been attacked two times previously, in 2014 and in 2016, according to open source materials and reports from human rights monitoring groups. If the Russian-Syrian alliance was targeting a populated area with no apparent military presence or target, it would violate international humanitarian law. To better understand what happened in this regional town, the Syrian Archive used open source investigative techniques, spoke with sources on the ground, and analysed flight observation data to better understand uploaded user generated content documenting the incident. By examining a variety of sources of information, the Syrian Archive was able to corroborate and strengthen its findings. Visual content gathered and verified by the Syrian Archive was extensively analysed – including in-depth geolocation with satellite imagery. All times provided are in Damascus local time, and in 24-hour format. The findings are presented in the following report, structured by the questions of the who, what, where, and why of this incident. Findings regarding this attack were characterized by repeated bombardments, lack of warnings, and an absence of active military hostilities in the vicinity of the attack. Through collecting, verifying and reporting investigative findings from these incidents, the authors hopes to preserve critical information that may be used for advocacy purposes or as evidence in future proceedings seeking legal accountability. Human Rights Watch: Syria in Talks focus on protecting civilians. The added value of this report to the efforts mentioned above includes damage identification, as well as cross referencing and contextualising visual content (20 verified videos) with satellite imagery and with flight observation data provided by a spotter organisation of aircraft in the immediate vicinity of hospitals at the time of attacks. Geolocation of visual content was done in collaboration with the Bellingcat Investigation Team. Located some 25 kilometers west of Aleppo city, Atarib is a small regional town with an estimated population of 30,000 mostly Sunni Arabs in 2011 before the Syrian war started. The city has historically served as a strategic transport hub between the governorate capital of Aleppo’s northern countryside, and the Bab al-Hawa border crossing with Turkey. Anti Assad regime demonstrations took place in Atarib as early as April 2011, and the city swiftly became an important hub for organizing protests in the wider district, as well as in Aleppo city itself. Atarib also assumed military significance against the Syrian regime following the establishment of the Free Syrian Army (FSA) and was among the first urban centres to host local military officers who defected from the Syrian regime in early 2012. The city soon had one of the largest numbers of defected officers in rural Aleppo, and the local FSA groups that were subsequently formed there went on to establish the al-Mutasem Bi’ allah brigade, who played a crucial role in driving Assad’s forces out of most of rural Aleppo, part of the city of Aleppo and rural Idlib. After the Syrian regime was forced out of Atarib in July 2012, a council of notables was formed – including elders and other influential figures (e.g. doctors, lawyers, intellectuals and religious scholars) – to facilitate decision-making through consensus and ensure the wider representation of different families. In October of that year, the council of notables agreed to establish a revolutionary council, part of a network of local administration councils in opposition-held areas intended to serve as an alternative to the Syrian regime. This includes taking responsibility for running the city and providing public services, including the establishment and supervision of a local court system and police service, active until the date of the publishing of this report. In late 2013, IS came to town, but was considered an “uninvited guest,” as Haid Haid writes in his article “How My Syrian Hometown Fought the Islamic State and Won”, published in Middle East Eye. Local resistance managed to oust the group from Atarib, and it did the same with al-Qaeda-linked Jabhat al-Nusra in early 2015 when they tried to capture the city, as Haid Haid writes in a Chatham House report. Many videos were posted showing the residents in Atarib city protesting against Jabhat al-Nusra. Currently the Atarib civilian council is managing the city and providing services to civilians. As can be seen in the 13 November 2017 from LiveUMap provided below showing areas of control in northern Syria, at the time Atarib was attacked it was far from any frontline or clashes (In red: Syrian government – in green: Syrian opposition forces – in yellow: SDF forces – in black: ISIS). These areas included Idlib province, some parts of northern Homs province, as well as some parts of adjacent provinces (Latakia, Hama, and Aleppo), Eastern Ghouta in Damascus countryside and some parts of southern Syria. A zoomed in look at the Russian Ministry of Defense’s map (above) clearly shows that the bombed location in Atarib city is part of the de-escalation zone established during the Astana talks. On 13 November 2017, Atarib’s public commercial market and a nearby police station were targeted by three air strikes, according to reports from media activists, humanitarian groups, news agencies, and the Syrian Civil Defense in the Aleppo governorate. The claimed damage of these airstrikes were filmed and photographed and uploaded to social media platforms. The same day, Syrian Civil Defense published a video showing the first moment of attacks claimed to be targeting Al Atarib city. At 0:06 a far away explosion can be seen while the civil defense team are driving towards the impact site, then at 0:33 an explosion that happened close to a market can be seen. Women and children can be seen at the impact site. At the end of the video we see injured including children were being transferred to a medical facility to be treated. The video has been geolocated through using available satellite imagery, as shown below. Four buildings can be identified as well as the blue building. The two roads leading east are also clearly visible in the video. Shortly thereafter, at 14:13 local time, Atarib24 indicated that a third airstrike had occurred. The first video, published on Facebook by “The Syrian Revolution Coordination in Atarib City and its Villages”, claims to show the first airstrike on the Free Police building in Atarib. The moment of impact is visible. The video is timestamped 2017/11/13 at 15:07, which is consistent with the timing of the other attacks. Using openly available satellite imagery, it is possible to confirm the location the car as it drives southwards towards a junction in central Atarib. At 8 seconds into the video, the impact of an apparent airstrike on this building is visible, which is described as the Free Police building. The second dashcam video, uploaded to Facebook by “Mouhammed Saber”, also shows a timestamp: 2017/11/13 at 15:12, suggesting that if the time is correct it shows the moment of impact three minutes after the first airstrike on the Free Police building. This is also the time reported of the second airstrike in Atarib that day. To corroborate this analysis, the Syrian Archive team interviewed the source of the video who reaffirmed the location in which the video was filmed matched the geolocation seen above. To verify the time of the second dashcam video, an analysis of sun shadows was conducted using the SunCalc tool. The time of the airstrikes at 14:12 Damascus time is consistent with the shadow of the building that appears where the car is parked. Al Jazeera has published a video about the first moment of the attack when the air-to-surface munitions were dropped on the market. 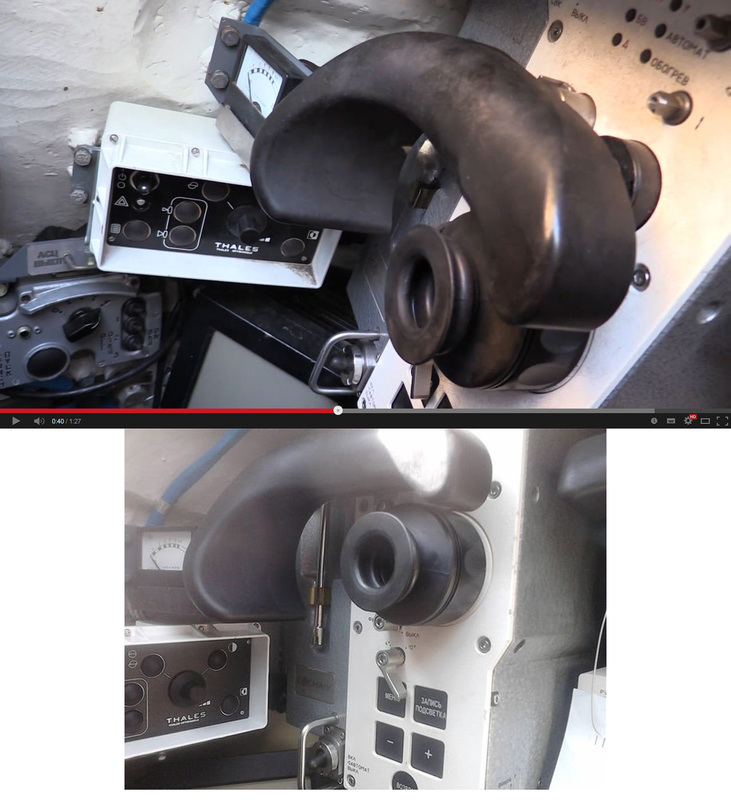 The following objects have been identified from Al Jazeera video reported by Suhaib Al Khalaf. The four objects dropped immediately before the explosion can be seen in the following image. A light green mosque dome and a mosque minaret can also be seen in the video from Al Jazeera. As the same minaret can be seen in multiple frames of the video from multiple perspectives, and in other videos when civilians are being rescued in the aftermath of the the attack, it becomes possible to use this as a reference location for geolocation purposes. The location of the light green dome appearing in Al Jazeera video has been geolocated to be in Atarib, as shown below. As a result, it possible to verify that the Al Jazeera video in which four objects were being dropped in the direction of the market was in fact filmed in Atarib, as was claimed. Thiqa news agency published a drone video showing the destruction in the market as well as the police station building on Nov 14th, 2017. The two frames below show the same market before and after the attack – the first frame, taken by RFS media office with a drone and the second, taken by Thiqa news agency, of the same building after the airstrike. The Syrian Archive team was able to geolocate the police station building shown in the drone video of Thiqa news agency through Google Earth, which makes it the fifth destroyed building as a result of the attack. The sixth damaged building was located in front of the police station building as seen below. The Syrian Archive team was able to geolocate this building using a photo published by Muhammad Shakrdy, and a video published by RFS media office on 13 November 2017. Through comparing where flights were observed, the type of aircraft observed, the time flights were observed, and the direction flights were heading, and comparing this data to geolocation conducted in earlier steps, the Syrian Archive was able to identify several flights potentially responsible for the attack (several fixed-wing Russian aircraft), seen circling in the immediate vicinity of the geolocated attack site. Previous research has found that circling flights typically indicate target acquisition and/or preparation for imminent attack. While there is no direct evidence available that one of the observed aircrafts was involved in the attack on Atarib, the presence of these aircrafts increase the likelihood that an air attack occurred at this location and the time stated by the citizen reporters as well as humanitarian groups, and also estimated using imagery from the attack. The Atarib coordination committee published 64 names of the civilians that were killed as a result of this attack. They also posted 4 names of missing persons after the attack. Rashad Mohammed Abdrrahim, a civilian. Omar Ali Rasheed, a civilian. Abdulqader Mohammed Eid al-Badawi, a civilian. Mohammed Khalid Mesto, a civilian. Omar Abdo Rasheed, a civilian. As’ad Haj Taher, a civilian. Mohammed Ammar Deebo, a civilian. Hazim Khaled Deebo Ibrahim, a civilian. Nasir Haj Mar’ei, a civilian. Mohammed Nasir Hej Mar’ei, a civilian. Mohammed Mahmoud Abian, a civilian. The laboratory physician, Ahmad Omar Isa, a civilian. Abdelazeem Ahmad Jaqoum, a civilian. Hamoudeh Faisal Ibrahim, a civilian. Deebo Abdulqader Deebo, a civilian. Hasan Ibrahim Shweif, a civilian. Abderrazaq Ali al-Ameer, a civilian. Mohammed Hussein Hijazi, a civilian. Ali Faker Rasheed, a civilian. Nasir Ahmad Hajer, a civilian. Mostafa Ahmad Da’doush, a civilian. Ahmad Hussein Jablawi, a civilian. Mohammed Nour Hayed, a civilian. Ammar Hussam Barakat, a civilian. Redwan Ayoub Haj Hamada, a civilian. Mohammed Munir Saleh, a civilian. Mohammed Abdo Haj Mar’ei, a civilian. Naji Sheikh Ibrahim, a civilian. Ahmad Othman’s wife, a woman. Asma Riyad Khalil, a woman. Zanoub Sheikh Abdel hay, a woman. Hiba Othman, a woman from al-Leramon. Zahra Hussein Jablawi, a woman from Kefr Nouran town. Moayad Abdo Waheeba, a child,. The daughter of Mohammed Qayes Haj Mar’ei, a child. Ayman Abdo Karbo Zarzor, a handicapped child with polio. Ahmad Saied Ibrahim, a missing child. Mohammed Abderrazaq al-Faj, a police officer. Yamen Saeed ash-Shon, a police officer. Hamdo Saeed ash-Shon, a police officer. Omar Mohammed Deeb Shahoud, a police officer. Hussein Sha’alan Abderrazaq, a police officer. Mostafa Mohammed Othman, a police officer. Jbraeel AbdlWahid Jbraeel, a police officer. Ibrahim Mohammed Ibrahim, a police officer. Ahmad Abdo Taher, a police officer. Hamdi Ways al-Ali, a police officer. Mohammed Hamdo Hamdo, a police officer. Fadl Mohammed Eid Abdurrahman, a police officer. Basil Mohammed Shahid al-Hussein as-Sawadi. This is not the first time the Atarib market has been targeted. On 25 July 2016, Smart News Agency published a video showing the destruction of a building located on the market street which was claimed to be as a result of airstrikes. Eight civilians were reported killed as a result of this attack. Thiqa News Agency and Qasion News Agency published videos on 25 July 2016 showing the destruction in Atarib market as a result of the attacks. The Syrian Archive team has matched objects from Smart News Agency video with objects seen in the drone video taken by RFS media office before the attack. The damage to the building in the video published by Smart News Agency can clearly be seen. An earlier attack on the Atarib market has also been reported on 24 April 2014. The Violation Documentation Center published a report about this attack. VDC has documented 31 names of civilians killed during this attack. The YouTube channel of “Omar Ez El Deen” published a video about the Atarib market attack showing killed civilians in the streets as a result of airstrikes mentioned in the VDC report. Another video about this attack was published by Amer Alfaj showing civilians killed as a result of the attack. Since its founding in 2014, the Syrian Archive have collaborated with organisations including Human Rights Watch (HRW), Amnesty International, Berkeley University and Essex University, Witness, Bellingcat and various agencies of the United Nations (UN), specifically the Independent International Commission of Inquiry on the Syrian Arab Republic. The authors of this report have strived for accuracy and transparency of process in reporting and presentation, while balancing the need to protect the safety of those providing documentation in some instances. With these interests in mind, detailed methodologies for some information deemed sensitive have not been published. With that said, while all efforts have been made to present our best understanding of alleged incidents, it is recognised that the publicly available information for specific events can at times be limited. If readers have new information about particular events; find an error in our work – or have concerns about the way we are reporting our data – please do engage with us. You can reach us at info@syrianarchive.org. But both deny and fail to provide such material (material that they MUST have as they decided to attack). So in 2016 the building next to the twin tall electrical poles was destroyed, but in a drone video of the market supposedly taken in 2017 it was intact? Thomas, so what about your lies about the Russian-Belarusian sights “Sosna-U” on Ukrainian tanks? Or your another lies about that “Sosna-U” is Thales “Catherine” licensed copy? LOL. You are so stupid. thats part of the system, yes. you’d have to be a bit of a moron to think it consisted of literally just a camera. So, yes YOU are moron and liar. Ukrainian tanks with “Sosna-U” sight do not exist. Only Russian tanks have it. Nice green box. What’s inside? LOL. According to this tweet it’s “Sosna-U” inside the box. And Ukraine havent’t “Sosna-U”. And “Sosna-U” is NOT “Catherine”. And not a licensed copy of “Catherine” . Like a gear lever is NOT a car. Tanks with “Sosna-U” is Russian tanks. NOT Ukrainian. 2. ”Ukraine has the Sosna U sight”- You lied. 3.”Those were just Ukrainian tanks” – You lied. Ukraine has Catherine. The tanks in Ukrainian markings in Ukraine which are said to be Russian have Catherine. Yes, Ukraine has Catherine. Also Russia has. But Ukraine haven’t Sosna-U. The Russian tanks in Ukraine has “Sosna-U” (also. another specific Russian equipment). 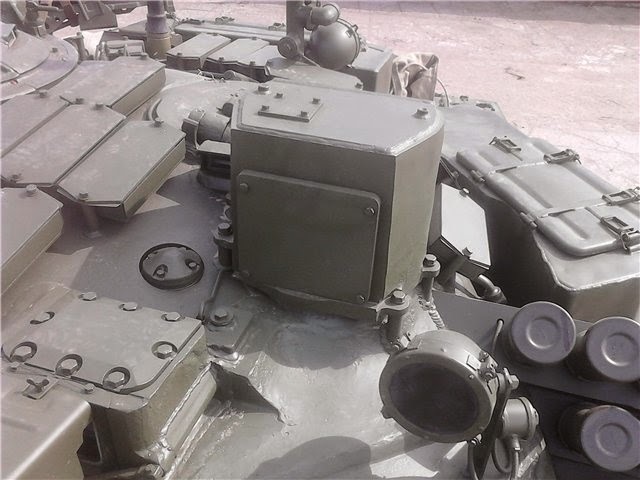 The tanks in Ukraine have Thales Catherine equipment. So since they are in Ukrainian markings, common sense tells us they are Ukrainian. as for the Sosna U, people such as the twitter account I cited say it uses the Thales Catherine sight as well. I value their opinion over yours. Now please go and post on the correct thread. This isnt about tanks. “The tanks in Ukraine have Thales Catherine equipment” – yes, Russia has “Catherine”. And the Russian T72B3 tanks in Ukraine has “Sosna-U” and another specific Russian equipment. “as for the Sosna U, people such as the twitter account I cited say it uses the Thales Catherine sight as well.” – also they say that this is “Sosna-U”. Tanks with Sosna-U are Russian tanks. NOT Ukraininan. 4.”So since they are in Ukrainian markings, common sense tells us they are Ukrainian.” – You lied. You can see Russian language inscriptions, not Ukrainian. So Bcat, you know the image of the undamaged building next to the twin poles you said was taken from the RFS Media drone video from 2017? Where is it in this video exactly, because it doesn’t seem to be there? It’s this image I mean, the top one. When does it appear in the RFS drone video? It is hard to believe that Bellingcat or the Syrian Archive could be unaware of these clashes and one has to ask why the authors kept this information from their readers. Hmm. So Hayyaat Tahrir al-Sham brought a lot of armed terrorists into the centre of Atarib to assist their struggle against Al Zenki. Then, if the date of the bombing is correct, this concentrated force was bombed? Sounds like a well executed operation. The chart showing the aircraft spotted and their locations is very blurry, it’s really hard to make it out. Could you post a higher resolution image so the chart is actually legible? It would be much appreciated. I enlarged the chart by zooming in with windows paint. It seems to say there were no incidents in Atarib on 13th November.